You can protect your home from the harsh weather in Broomfield, Colorado when you choose Scottish Home Improvements as your siding contractor. We can help you discover the affordability and low maintenance available with several different types of home and business siding. When purchasing new siding for your Broomfield property, you’ll probably consider the insulation that the various siding options can offer as well as the materials’ abilities to withstand the weather. 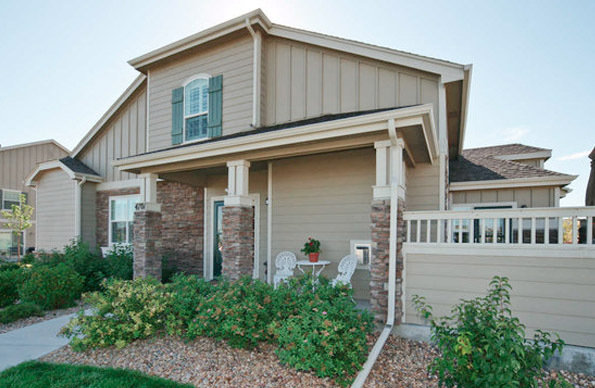 This is why so many property owners in Broomfield are turning to James Hardie® fiber cement siding. This material has proven to be long-lasting and protects your home from the harsh climate that Broomfield experiences in the winter. James Hardie® fiber cement siding can be installed with a factory pre-painted finish called ColorPlus® which carries a 15 year warranty on the finish as well as a 30 year prorated product warranty. In the past 10 years, Scottish Home Improvements has installed ColorPlus® on many Broomfield homes and the product looks as good today as it did when first installed. This type of siding material needs little to no maintenance, as it holds up so well to the elements. We will always be happy and proud to let you know where you can visit our work locally. James Hardie® offers many different styles and colors for your home. This means that we can recreate the style of your home currently or create something completely new. Our team can use a CAD program to take pictures of your home and show you what your new siding options are. This is the best way to show you exactly what your siding will look like before we even begin installation. Our dedicated team will take you through our many options and help you to make key choices that will best fit your preferences and the needs of your home. Choosing James Hardie for Innovative Homes from Colorado Siding on Vimeo. The siding industry has gone through quite a few changes in the last decades because of a new, cost-effective siding product–LP SmartSide. It is one of the industry’s newest additions and is growing fast while changing the way homeowners in Broomfield and all over the US side their homes. LP SmartSide is an engineered wood product made with a strand and fiber substrate bonded with epoxy–making it which is durable and authentic. Why Is LP SmartSide Good For Homes In Broomfield? One of the best selling points of LP SmartSide is its stunning appearance. It comes in a variety of styles like panel, lap, and shingle but what really sets it apart are its rich colors. With all the bold, beautiful LP offers, you are sure to find a color to suit your home’s unique charm. 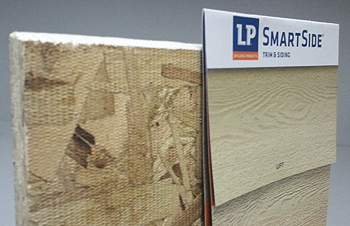 LP SmartSide is made out of resin and wood, making it less brittle than Fiber Cement but still harder to dent than Vinyl. This makes LP a great choice for homes in Broomfield that see more than their fair share of hail storms throughout the year. What our clients love the most about LP SmartSide is the price. It is much lower than Fiber cement (25%-35% less expensive) and just as lovely. Pound for pound, it is hard to get a siding product as durable, beautiful and affordable on the market today. When looking for the very best installer for LP SmartSide on your Broomfield home, look no further than Colorado Siding. We have over 25 years experience and we get the job done professionally, on-time and in budget every time! 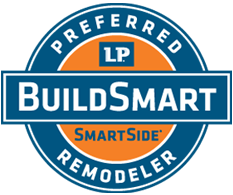 Contact us for a free consultation and for more information on LP SmartSide for your Broomfield home today. Steel siding is an excellent option for commercial buildings. The aesthetic appeal doesn’t make it a great choice for residential buildings, but you can be sure the steel will hold up under the worst weather for your business. Steel siding also requires very little maintenance, unlike many wood and vinyl options. Alside steel siding has created a more residential-friendly product that actually imitates the look of wood paired with the durability of steel. If you’d like to pursue the popular stucco styles, James Hardie® VerticalPanel stucco texture is the best choice. This siding will hold up against the dreaded woodpeckers that destroy traditional stucco all over Colorado and therefore requires little maintenance. This simple style is very popular in Broomfield and all throughout Colorado. We always recommend vinyl siding for Broomfield homeowners on a strict budget. Vinyl siding is the most affordable choice, offering versatile aesthetics and proficient durability. Vinyl siding also offers lower maintenance when compared to wood or cedar siding. Before making a decision on your new siding, let Scottish Home Improvements give you information and prices on all the options. Our unbiased advice and customer service has earned us an A+ Better Business Bureau rating and a reputation that’s second to none among Broomfield residents and throughout Colorado. Scottish Home Improvements is honored to help the Broomfield community with siding repair services. 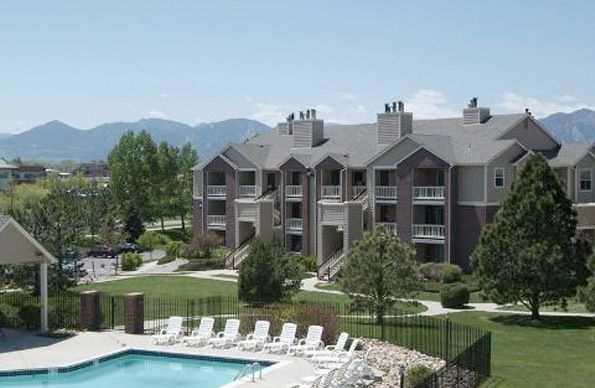 We’ve helped repair many commercial and residential siding projects throughout the Broomfield area. Our siding experts understand the diverse requirements of different siding materials, ensuring a stress-free and timely repair process. We limit downtime as much as possible, minimizing home and business inconvenience. Scottish Home Improvements wants to earn your business. Give us a call or send us an email today to learn more about adding new siding to your Broomfield home or business. Our experts can answer all of your questions and set up a free, on-site consultation today!